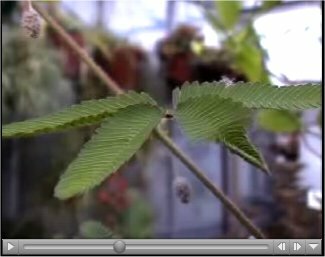 Below is a link to a video that Indiana University's Department of Biology has posted. The plant shown here is a called a Mimosa. The leaves of Mimosa have the capability to display thigmonasty (touch-induced movement). In Mimosa, the mechanical or heat stimulus induces an electrical signal, similar to the electrical potentials in nerve cells, that can move from cell to cell at a high rate. When the electrical potential reaches specialized "motor cells" in pulvini at the base of each leaflet, the folding is caused by a rapid efflux of potassium followed by rapid water transport out of the motor cells. This is just one amazing example out of millions that shows God's glory in His creation. What a God!